How can something so cool be so hot? 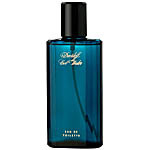 It's a challenge fragrantly conquered in Cool Water Eau de Toilette. This liquid fire of a fragrance blends bright top notes of pepper, basil, lavender, and jasmine, and balances them with base notes of tobacco and leather, sandalwood and musk.